I, like any girl, love to monogram things. There's just something about seeing those three letters on objects that's just a great feeling. I love it because it adds a little touch of something special to whatever it is you're monogramming. Who doesn't love personalization? Plus it's cute and makes your things stand out from the rest. You can monogram notebooks to sweatshirts, computers, coffee mugs and everything in between. 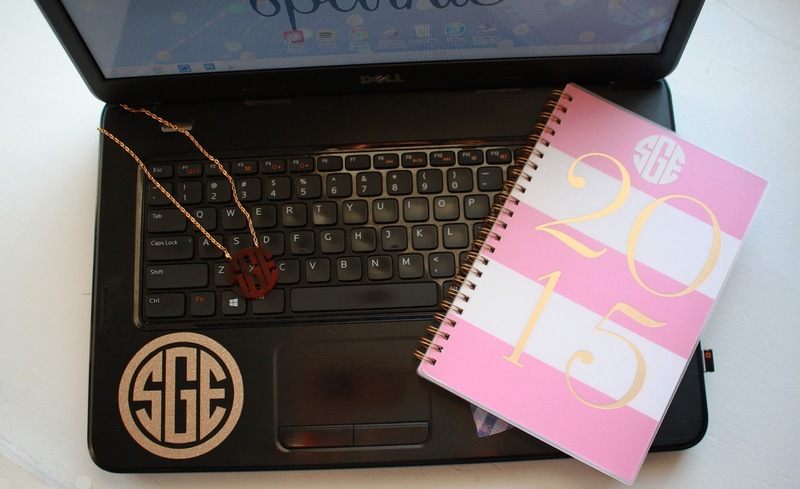 Today I'm going to be sharing the best things to monogram and not monogram! A little brief history of monograms first. The monogram is typically your first name initial, last name initial and then middle name initial. So my name is Samantha E. Goble; my monogram would be SGE. Note: I do have a middle name but it's interesting, so for the sake of this example I will not type it out. If you are married tradition says ladies first name initial, couple's last name initial and gentleman's first name initial. You can have a monogram with the 'classic' 3 letters, just your first and last initials or just your first or last initial. Here's a couple of fun articles that explain everything monogrammed; Monogram Guide and Politics of Monogramming. Now what can you monogram? Literally anything can be monogrammed. But that being said there are some things, in my humble opinion, that should not be monogrammed. Items such as boots and shoes, certain jewelry, certain clothing items, cars and yourself. Do not monogram yourself. Just don't. I also do not think that obnoxious monograms |read: wearing a million monograms at the same time| or large monograms, like the ones on the sweatshirts. I am not a fan of them but if you are then you go girl. 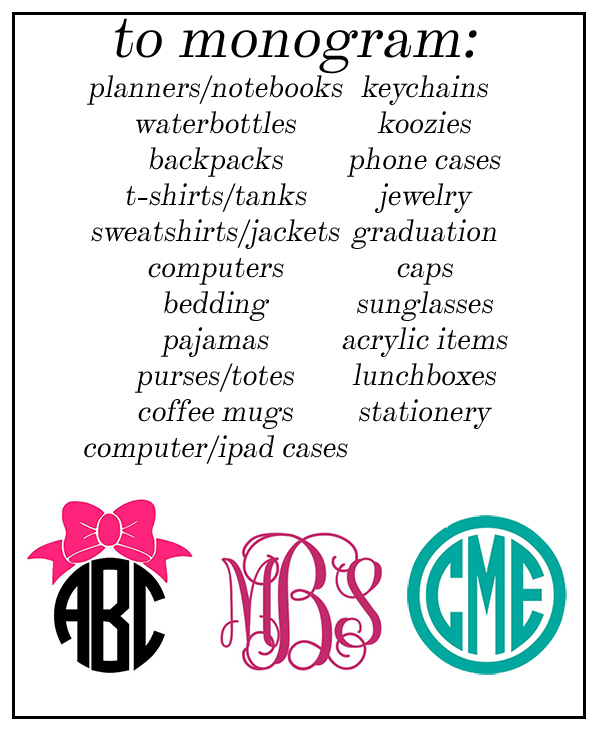 Here are a few things that I have monogrammed. I also have lots of first name single first name initial monogrammed things like coffee mugs, notepads, etc. I've found these at a variety of stores like Target, HomeGoods, Kirkland's Home Decor, Office Max, Steinmart and Gordmans. Where can you buy monograms? I use monogrammed decals which I get off of Etsy. I love this because it's inexpensive and I can monogram anything that I already have. If you just search monogram decals hundreds of results will pop up. They range in price, size, color and design. My necklace is from KnotJustBracelet's. You can also buy pre-monogrammed items off of Etsy or one of these shops, Marley Lilly, White Elephant Designs, Personalized From Me to You, Dixieland Monogram, and Mark and Graham. By no means is this a complete list. There are toooons of places that offer monogramming. Stores like J.Crew, Lands End, LL Bean and GiGi New York offer monogramming on clothing and purses. There you have it my guide to monogramming! I love monograms and will continue to monogram. I can't wait till I change my monogram and I can buy monogrammed home things and things for my kids! You can bet I'll be that wife/mom with monogrammed everything #noshame. "a girl can never have too many monograms"